The families of beloved Pug, GCHP Hill Country's Let's Get Ready To Rumble, "Rumble", proudly announce the establishment of an annual Clinician-Scientist Fellowship with the AKC Canine Health Foundation (CHF). The AKC Canine Health Foundation “GCHP Hill Country's Let's Get Ready To Rumble” Clinician‐Scientist Fellowship will serve to sustain future advancements in canine health by helping support the next generation of canine health researchers. Rumble's owners, Carolyn and Gary Koch, breeders Kristy and Kevin Ratliff, and handler Esteban Farias have chosen to honor Rumble in this way, saying, "It is in honor and in memory of Rumble that we would like to present this Fellowship to a dedicated and deserving individual, whose studies are in veterinary medicine and research, so that he or she may achieve their goals and aspirations while working toward providing better lives for our beloved pets, like Rumble." Rumble was born on March 24, 2014, and as a youngster just entering the ring, he finished his AKC Championship in just three weeks. At a year old, Rumble was already a Multiple Group Winner, a Multiple Best in Show winner, and a Multiple Best In Specialty Show winner. He was adored everywhere he went, and by those who had the opportunity to meet him. He quickly became known for his showmanship in the ring, and his relaxed, laid back nature outside of the ring. Rumble was recognized and appreciated for his flawless movement, beautiful head, and overall balance, and has been honored and awarded by the most well-respected judges in the fancy. In 2015, at a year and a half of age, he was the Nation’s #1 Pug, #1 Toy, and the #4 dog overall in the National Owner Handler Series. In 2016, he ended the year as the Nation’s #1 Pug – All Systems, and the # 2 Toy in the country. Rumble was awarded multiple Best of Breeds at Westminster and at the AKC National Championship, and was awarded a Toy Group 2 at Westminster in February of 2017. In 2017, he had already been awarded 25 Best In Shows, bringing his career total to 42. On June 5, 2017, while on his regular morning walk, Rumble collapsed, and died instantly. Rumble had just received a wellness exam the week before, and was the picture of health. Preliminary reports showed nothing abnormal, and the final report cited, “The cause of death could not be definitively determined.” Rumble was only 3 years old, and was in the prime of his life and show career. At the time of his passing, Rumble was the Nation's #1 Pug, #1 Toy, and the #2 Dog All-Breed in the country. His breeder, Kristy, noted, "With all of Rumble’s accolades and accomplishments, his loss wasn't mourned because of his winnings or his status as a show dog, but instead for the beautiful dog he was inside and out. 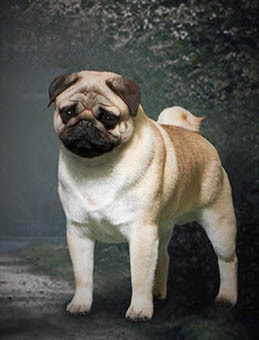 He was truly an outstanding representative of the Pug breed, and he will be admired for generations to come." "To his owners, breeders and handler, I want to first express our sympathy for the loss of Rumble. I had the opportunity to meet Rumble, watch him in the show ring, and watch him play with Esteban's daughters," said CHF CEO, Dr. Diane Brown. "This is a lasting tribute to a special dog, and will keep his spirit alive as future generations will receive funding for advanced veterinary education in honor of Rumble. We at CHF are thankful that Rumble's life is being honored in this meaningful way." The AKC Canine Health Foundation Clinician-Scientist Fellowship program was started in 2013 to support the next generation of canine health researchers, and awards grants to outstanding residents or graduate students at US schools of veterinary medicine. To date, 22 fellowships have been awarded.